What are the consequences of a thawing North? The effects of global climate change are hugely amplified in the Arctic. Over the long term we can expect this iconic, frigid place to experience temperature increases much larger than the world average. This poses numerous environmental threats, including loss of polar species, increased release of greenhouse gases, and shrinking ice, wetlands and lakes. From an economic perspective, the temperature amplification may benefit some Arctic countries, especially the five littoral states of Russia, Norway, Iceland, Canada, Greenland and the US, all of which enjoy direct access to seaways of the Arctic Ocean. Although thawing landscapes make ground activity increasingly difficult, marine operations are becoming easier during summer, owing to shrinking extent and thickness of sea ice. In our own research at UCLA, we show that even the North Pole will likely become traversable by ice-strengthened ships in the coming decades. As the world’s richer, growing population demands ever more natural resources, rising commodity prices will motivate development in remote areas, including the Arctic. Globalisation and immigration are driving surprisingly high rates of population growth in most northern countries. The economic prospects will also have impacts on diplomacy. 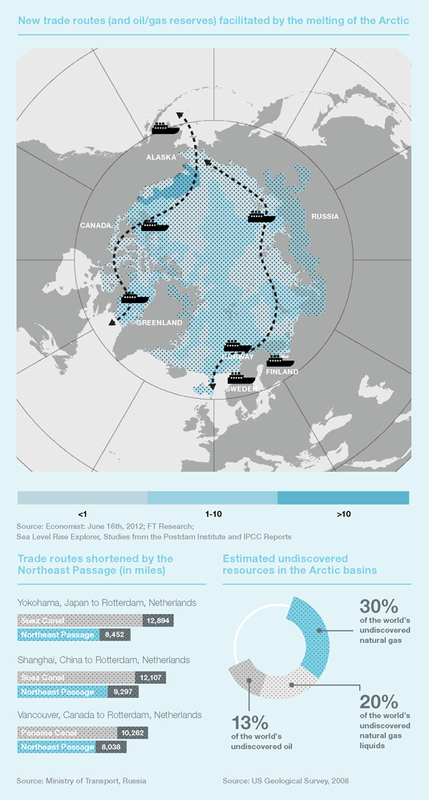 Will we see non-Arctic states aligning themselves with Arctic ones? Iceland, for example, is developing remarkably strong ties with China, including a new free-trade agreement that is quite extraordinary for a country of just 320,000 people. These trends have created passionate debates about the future of this important region, ranging from calls for rapid oil and gas development to the creation of an Arctic park. If the region’s resources are developed, sustainability will be key. The world needs clear-eyed discussion about these controversial issues, including mitigation of climate change and resource extraction impacts, the role of native peoples, and the region’s growing importance to the rest of the world.